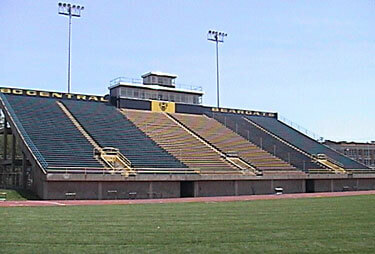 In late April, officials at Western Michigan University (WMU) informed Drum Corps International of the need to install new artificial turf in their stadium, conflicting with the July 15 DCI Kalamazoo major event in Kalamazoo, Mich. As a result, DCI is unable to use WMU's stadium on the scheduled date and will move the event 20 miles east to Battle Creek Central High School in Battle Creek, Mich. "While we are surprised and disappointed in the timing and the circumstances involved with WMU's decision, we are thrilled with the enthusiastic reception we have received by the school administration in Battle Creek," said DCI executive director Dan Acheson. "We think you will find the stadium a great venue to see and hear drum corps." Current ticket holders of the former DCI Kalamazoo event have been informed of the venue change via e-mail and will be asked to indicate their preference to be reseated or refunded the cost of their tickets. The new DCI Battle Creek event will consist of sixteen corps originally scheduled to perform in Kalamazoo, including perennial DCI finalists Blue Devils, Bluecoats, Boston Crusaders, Carolina Crown, Madison Scouts and Glassmen, among others. "Western Michigan University has served as a tremendous host to DCI during the past two years. While we are disappointed that we will be unable to perform there this year, we are looking forward to sharing the drum corps experience with another great Michigan community in Battle Creek," said Glassmen executive director Brian Hickman.